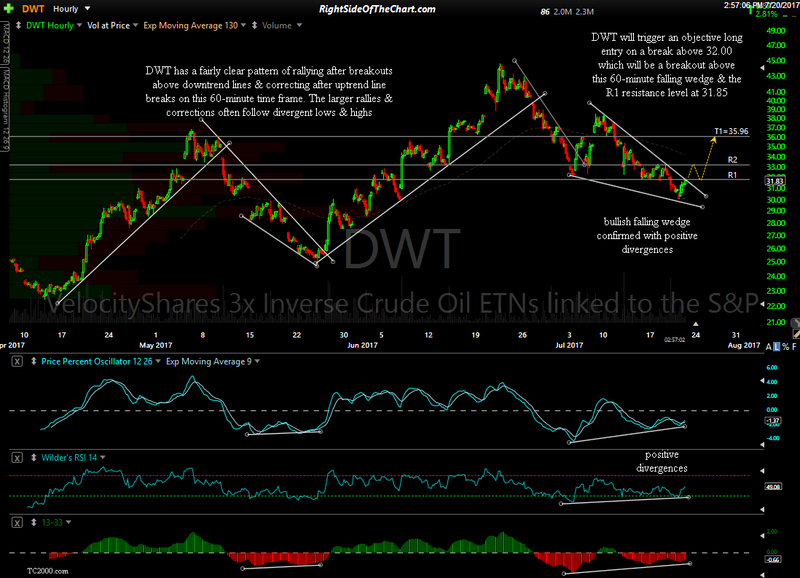 DWT (3x Inverse/Bearish Crude Oil ETN) will trigger an objective long entry on a break above 32.00 which will be a breakout above this 60-minute falling wedge & the R1 resistance level at 31.85. Member @getitriight had pointed out some bearish developments on the charts of /CL (crude futures) & posted shorting crude via DWT today (thanks for the heads up!). The sole price target is T1 at 35.96 with a suggested stop on a 60-minute candlestick close below 30.90. While I don’t often add the 3x leverage ETFs or ETNs as swing trade ideas due to the decay & tracking error that they often suffer when held for extended periods of time, this trade is based off the 60-minute time frame & is likely to only last a several days or under a couple of weeks. I typically use the charts of either futures contracts or the non-leveraged (1x) ETF/ETNs for charting purposes but when only viewing the recent history on the intraday charts, such as the one above, the leveraged ETPs often work fairly well at identifying key support & resistance levels, trendlines, chart patterns, etc.. While I’m giving the official entry a buffer of about 15 cents above where prices will break above the 31.85ish resistance & the wedge/downtrend line (assuming the breakout occurs soon, as I suspect it will), an aggressive trader might opt to take a position before the close today as there is a decent chance that DWT will gap above this wedge tomorrow if crude futures continue to move over this evening & into the morning hours. Should DWT get rejected off these intersecting resistance levels (31.85 & the downtrend line), one could also take a position if it falls back down to the bottom of the wedge with a stop somewhat below. As going long an inverse ETN, this trade is a short on crude oil & as such, will be assigned to the Short Setups category & as well as the Active Short Swing Trades category (assuming that the entry price above 32.00 is triggered soon).